Have you ever thought about writing an eBook? Are you interested in creating an opt-in resource or product for your music industry website? eBooks are becoming increasingly popular, especially with the proliferation of mobile devices. It’s so easy to take your gadget with you wherever you go and read your favorite books on the fly, whether it’s a novel or a self-help resource. If you’ve ever thought about putting your writing skills to use, writing an eBook is not only a good way to help people, but also a way to create a valuable income stream. If your resource genuinely helps people, they will buy what you have to offer. Many entrepreneurs and publishers have achieved good success with the creation of eBooks. If this sounds interesting to you, you can begin brainstorming and thinking about what topic to write on. For instance, you could write an eBook about the particular genre of music you play. You could collect quotes from experts and your peers. You could research trends and feature your findings in your book, which many would find helpful. Publishing can also build your authority in a particular niche. When you understand the steps you need to take to write an eBook, it doesn’t have to be an arduous, drawn-out process. All you need is a system – a step-by-step checklist you follow to gather the pieces you need to develop a product that people will love. The following infographic breaks down the process into simple, manageable steps – there are only 10 of them! And you know me – I love anything that makes my life easier. When I’m working on a project, I don’t want to be thinking about every task I need to handle. I like having frameworks and structures that make it easy for me to make fast progress on my project and get some quick wins. 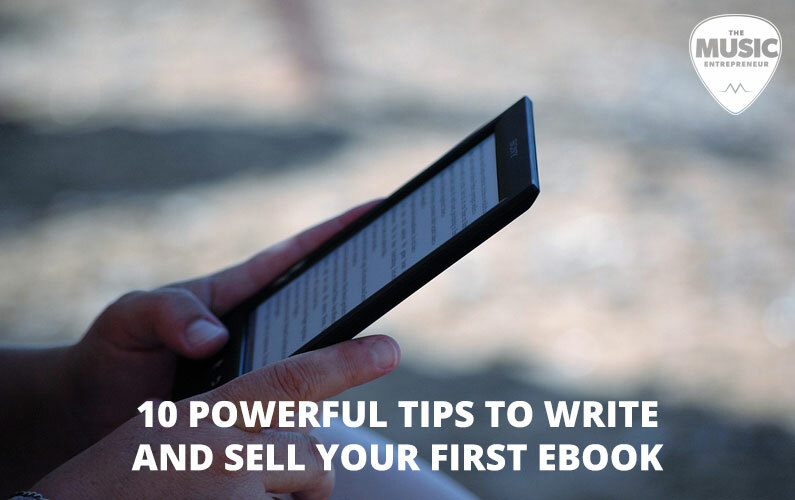 So, here are 10 powerful tips to write and sell your first eBook. If you decide to publish and sell an eBook, please leave a comment below and let me know. And if you have a finished product, feel free to share a link!